The objective of bioSyntax is to bring you closer to your data, giving you an intuitive & empathetic understanding of biology. To appreciate all that bioSyntax has to offer read this short manual (~10 minutes) and go explore. bioSyntax integreates seamlessly with vim (Linux / Mac / Win), sublime (Linux / Mac / Win), gedit (Linux / Win), & less (Linux / Mac). After installing bioSyntax files will automatically detected by file-extension. For very large data sets, it’s often slow to open them in a text editor. It’s best to use the command-line program less which will read your file from a data-stream. # If your file is uncompressed, it can be read directly. # as file formats are not recognized within streams. # with hundreds of columns). bioSyntax implements a novel, full IUPAC Nucleotide Code coloring. 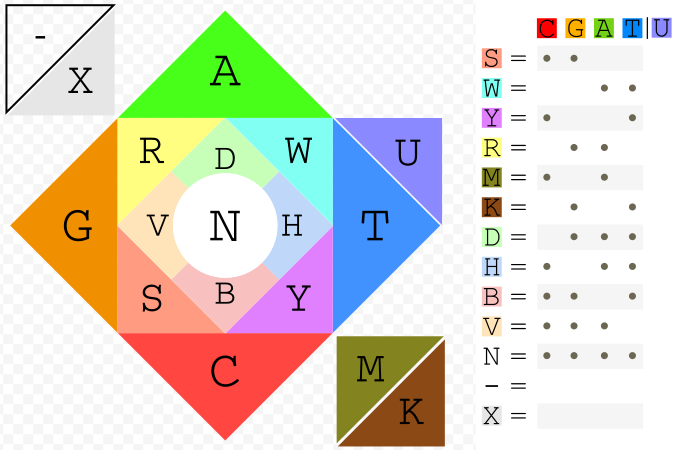 Ambiguous bases are represented by an ~additive color-mixing of the parent bases. For example, Thymine (blue) + Cytosine (red) are both pYrimidines (magenta). 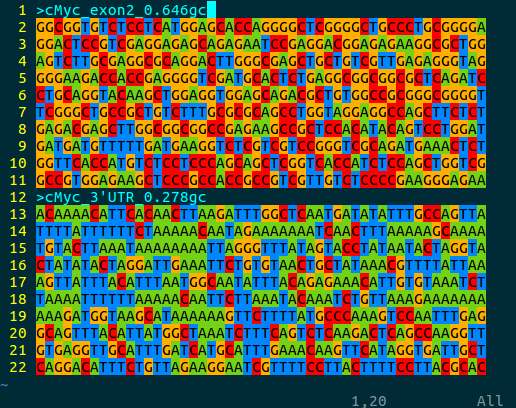 An intuitive feature of the bioSyntax color scheme is that the ‘GC-content’ of a sequence can be quickly approximated by how warm (high GC, red-orange) or cool (low GC, blue-green) a sequence looks. When available, bioSyntax will highlight PHRED quality scores in a step-gradient of blacks (PHRED = 0-10) to whites (PHRED = 40+). In .sam files the Query:Reference alignment is summarized efficiently but illegibly as a CIGAR String. With a little bit of highlighting these become much easier to read. You can choose from several color-schemes for amino-acid fasta files. The Fasta Clustal (Default) syntax colors amino acids based on their physiochemical properties, so does Fasta Hydrophobicity, or you may prefer better discrimination of each amino acids with Fasta Zappo or Fasta Taylor. File format and software compatibility matrix for bioSyntax. These syntaxes are not part of the unified bioSyntax suite but often serve specialized functions. If you’d like to add support for another file-format; check the development page to get started. 1) Search / Open an issue on the bioSyntax Repo. A detailed and descriptive title. Enough information about what did for someone else to replicate the problem. 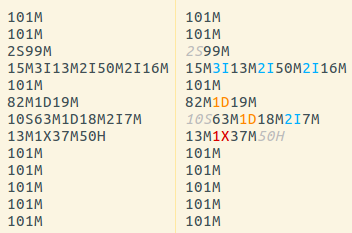 If it’s a syntax highlighting issue: a screenshot of the error and a small bit of the input file you used. 2) If you really don’t want to make a (fake) github account. Email [email protected] and we’ll open the issue, but it will be slower. bioSyntax is a community-oriented project for scientific syntax highlighting. We encourage you to change and customize it to suit your needs. Check out the Development page to create syntax-highlighting for custom file-formats and for other ways to help out.